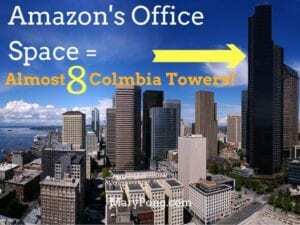 Amazon’s Real estate director said in 2014 that by 2019, the company would occupy 10 million square feet of office space. But that number has since grown to over 12 million square feet by 2022, which is the same amount of space as 8 of our Columbia Towers, Seattle’s tallest skyscraper. Amazon, which first operated out of Jeff Bezos’ garage in Bellevue in 1994 has grown to occupy over 8.5 million ft.² in the Seattle area alone. In late 2016, Amazon is scheduled to start construction on the third of three towers that Amazon will develop in Seattle’s Denny Triangle. Simultaneously, construction will continue on Amazon’s South Lake Union buildings the company has been leasing. Amazingly, 12 million ft.² equals around a third of all existing office space in downtown Seattle including space around South Lake Union and the Denny Triangle. According to a recent Geekwire report, Amazon makes up 42% of the best in class space in these key Seattle areas. To put this into perspective, Microsoft covers over 14.7 million ft.² of office space across the Puget Sound equal to 16% of all classes of existing office space in the region and 29% of the best in class space. Combining all of the total existing space and the square footage that is currently being built out, it will boost more than 9,300,000 ft.² of office space throughout the Puget Sound. This does not include the two buildings that the company is planning to develop further in the future on a fourth Denny Triangle block. This will bring the total to over 10 million ft.². Amazon has options for more land and office space in the Denny Triangle to build additional office spaces and they currently have the first right of refusal for several spots in this prominent Seattle location. Because of this growth, condominiums and townhomes are selling at phenomenal rates. Multiple offers and overpriced bids are commonplace in these popular neighborhoods within walking distance or a short distance to several Amazon offices. The key to nabbing one of these amazing homes is a real estate agent that not only knows the market but the buyers and sellers of the area. Competing with other buyer’s agents and coming in ahead of the competition is what Mary Pong does best. If you’re looking for a home, condo or townhome near any of the Amazon offices or future offices, contact Mary Today. Her expertise, knowledge, and commitment help her buyers get the home they really want.